Always allow your pan to cool down completely before cleaning. Never fully submerge a hot pan in cold water because this can cause irreversible damage. We recommend hand washing this product with warm soapy water. You can also put this pan in the dishwasher. Never use steel wool or metal cleaning pads on this product, it can scratch the surface. 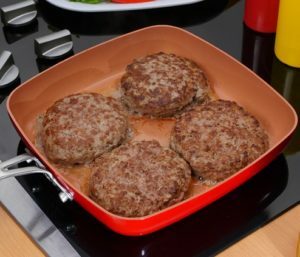 If burned or stuck-on food still remains after washing, you may need to soak the pan overnight to loosen the residue. 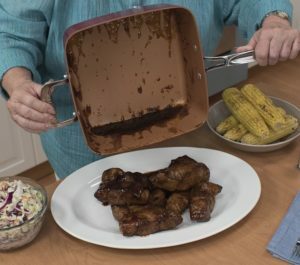 To prevent ruining the surface of this pan we recommend using non-metal utensils. Do not cut, slice, or chop anything inside the pan. The use of sharp or metal utensils can scratch the cooking surface, causing the pan not to perform correctly.